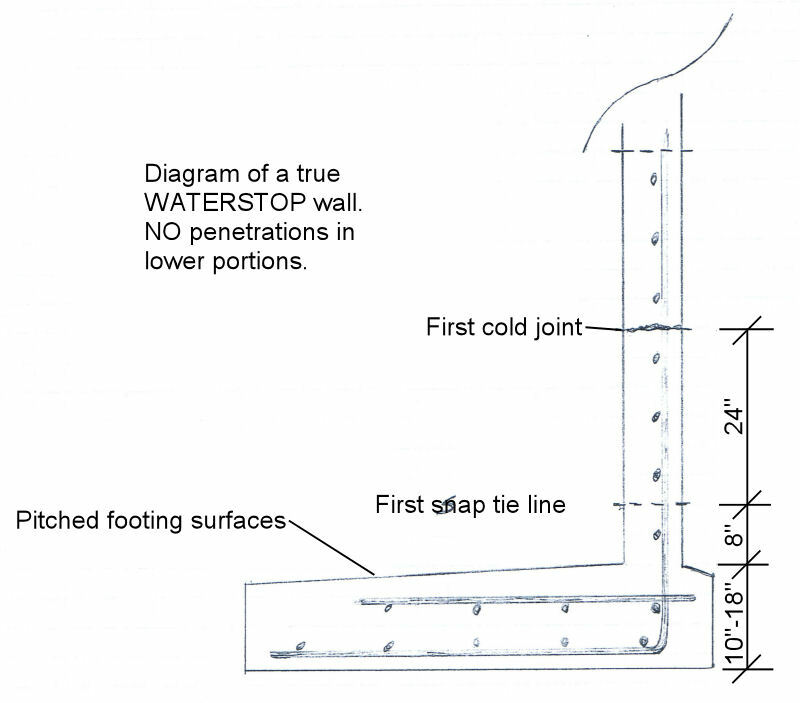 To keep water from entering the building envelope through the cold joint between the footing and the stemwall. To keep this same water away from interacting with the structural reinforcing steel which is holding the wall up. Building officials sleep better knowing that the structural steel in buildings they’ve approved is not going to rust off! When a foundation or retaining wall is backfilled, enormous tension is generated at the joint between footing and stemwall. 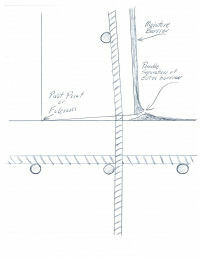 Here is a drawing of a foundation wall with the tensioned footing-to-wall interface blown up or exaggerated for clarity. 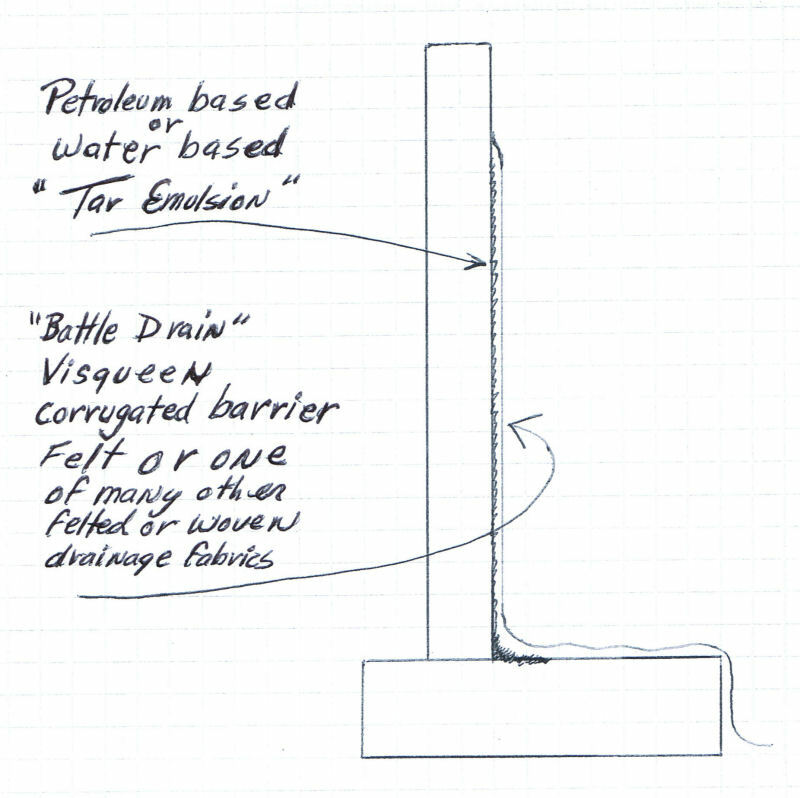 Now see 3 line drawings of methods commonly used to combat the problem of water intrusion. 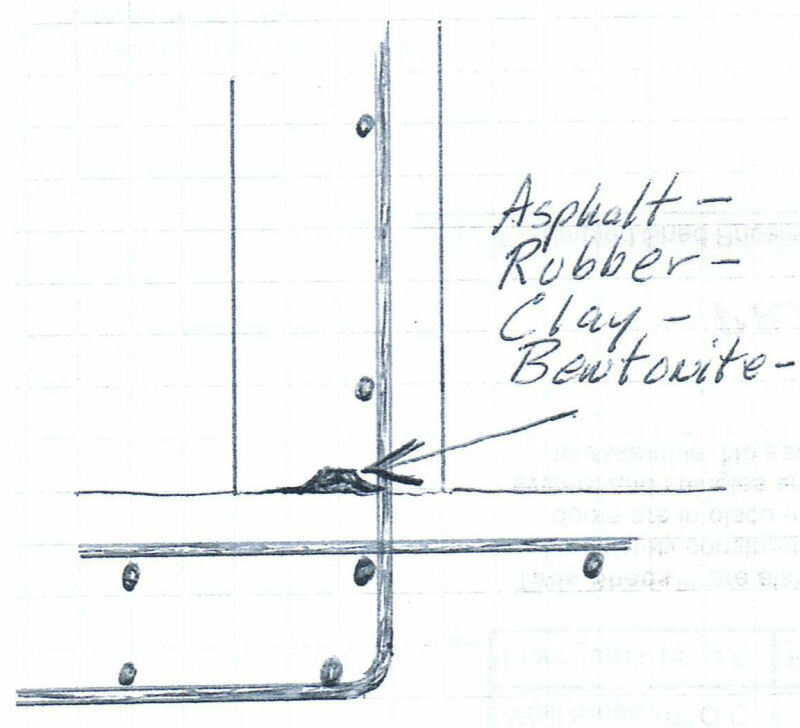 As the line drawings show, the various membranes and Bentonite clay solutions do nothing to protect the rebar. If groundwater is present, the bar is still sitting in a constant water bath. The next line of defense is “waterproofing the wall” or adding a water-resistant membrane to the outside face in an attempt to keep water outside. Here is a simple line drawing of this procedure. When the foundation wall is put under tension by backfill, the joint at the base of the wall tends to open up, breaking the moisture barrier (see below). Without going into endless detail, suffice it to say that there are many waterproofing products available. The Building Department approved minimum is called damp proofing and is a rolled-on or sprayed-on layer of asphalt, tar-based emulsion, or the equivalent. 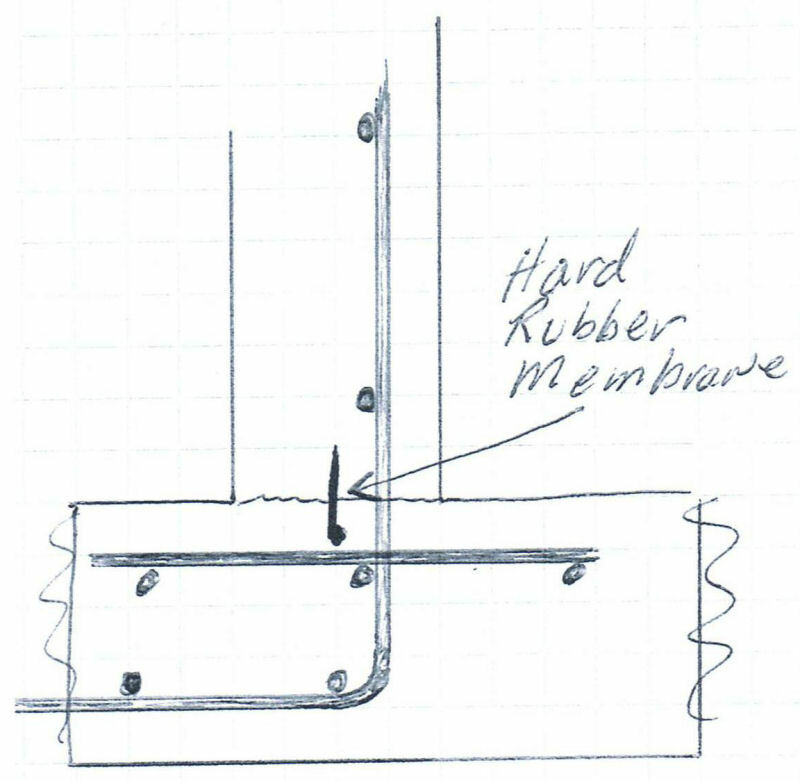 It is our position that counting on any membrane or sealing method is a mistake when one is dealing with a two-part footing and stemwall. Instead, steps must be taken to keep water from ever encountering the wall surface. 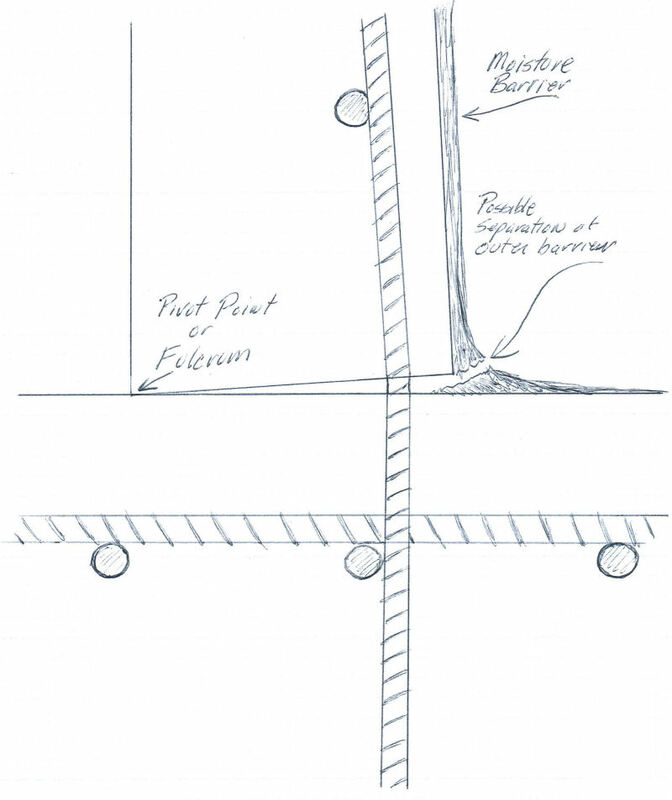 Mono-poured footings/walls may be sealed against water intrusion. We absolutely GUARANTEE our basements against moisture! How can we offer this guarantee? Because we understand water. We understand moisture intrusion problems and can completely avoid them--ELIMINATE them. We cannot, however, “fix” your existing leaky basement. We cannot come into your wet basement (not poured by us) and offer any magical solutions, although we do have a trained waterproofing specialist on board who has extensive experience with drying out existing projects. But we can offer you a product and/or a building path which completely solves the problem by not allowing water to ever intrude into the building. We offer two comprehensive solutions to water intrusion. Our first and foremost method involves directing the water in such a way that it cannot ever build up against the wall. This design path requires that the builder and the excavator and the foundation contractor all work together to achieve the end of directing the water positively away from the building envelope. Whoever installs and beds the final drain tiles can make or break the project. When the excavation shows a positive pitch, and the foundation contractor puts in the proper tiles then with proper piping it can be shown that water cannot enter the building. We have been involved with many projects which had water present. We’ve poured foundations in areas which had so much water welling in that we once included a water feature in the basement! 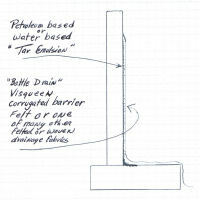 We’ve poured many jobs in such a way that these drainage measures could be monitored after the fact and I can think of many jobs here in Clark County and the surrounding area where to this day one can go into basements or crawlspaces and by opening a door or lifting a cover can see and hear running water yet the basement is DRY. Water control is part of our job and we take it seriously. 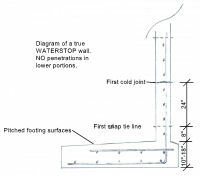 In the event that water cannot be redirected we offer our WATERSTOP WALL. Our wall is unique in the industry. 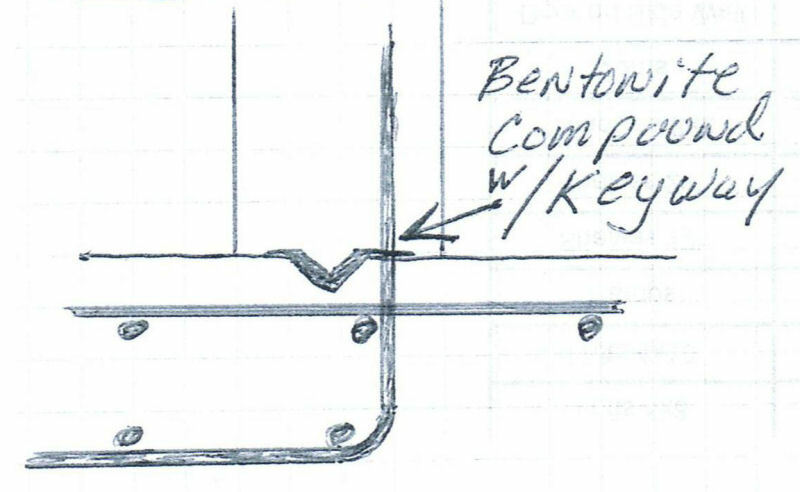 The wall shown in the line drawing below is completely free of penetrations in the lowest 18-24 inch portion. NOTHING in the way of penetrations! *Prices approximate. Prices subject to change without notice.